Some Christian traditions refuse to swear an oath on the Bible, in court or anywhere else. Their feelings are based in words from Scripture, but are they a valid understanding of those words? James summarises and repeats the lesson in James 5:12-13, “do not swear…”. But is it actually a prohibition, as it appears to be? Jesus does say, “Do not take an oath at all“, and it’s fair enough if someone wants to take that literally as a prohibition. I have no objection to that. I just don’t think it’s what Jesus meant to convey. Because Jesus recognised that the Law of Moses had provided for such oaths (“you have heard that it was said to those of old, ‘You shall not swear falsely…” – Matt 5:33), and Jesus did say, in the same context: “Therefore whoever relaxes one of the least of these commandments and teaches others to do the same will be called least in the kingdom of heaven, but whoever does them and teaches them will be called great in the kingdom of heaven” (Matt 5:19). So Jesus seems to acknowledge that the practice both exists and is not forbidden, but advises against it in general. This can be said to be an extension of the Third Commandment: “You shall not take the name of the Lord your God in vain, for the Lord will not hold him guiltless who takes his name in vain” (Exodus 20:7). The idiom, “take the name of the Lord”, etc. is a reference to swearing an oath and failing to honour it. Numbers 30:2 details this: “If a man vows a vow to the LORD, or swears an oath to bind himself by a pledge, he shall not break his word. He shall do according to all that proceeds out of his mouth“. Jesus’ advice, when taken literally as a general prohibition against oaths does actually pose a problem: When we marry, for example, we take an oath. Also, our participation in God’s covenant is a participation in the oath which is sealed in Christ’s blood. Clearly, oaths are not some kind of general problem. 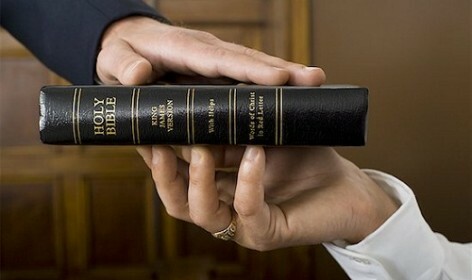 In fact, Paul writes: “I put you under oath before the Lord to have this letter read to all the brothers” (1 Thess 5:27). Actually, it could be said that God’s dealings with His people are almost completely understood to operate through covenant oaths. So what did Jesus mean? I was summoned on Jury service recently (See my blog post about it here: God and the Law in Queensland – A Juror’s Perspective). Because if Jesus’ words are not a general prohibition then I had better figure out what this does mean, so that I can know whether swearing an oath in court is ok or not! Jesus was cautioning against the practice, which is still prevalent today, of employing a throw-away idiom like, “I swear to God I’m going to do that”. This, used in the common flippant way, is precisely what the Third Commandment prohibits, and what Jesus is warning about. Evidently there were similar idioms in Jesus’ day, regarding the temple, heaven, the earth, Jerusalem, and even, “I swear by my own head” must have been popular! Another example in today’s popular speech, particularly in Australian slang, is “bloody oath”. This is an abbreviation of something meaning, “I would be prepared to enter a blood oath to affirm this”. A blood oath is one in which blood is shed in the establishment of the oath, and this characterises Ancient Near East practice when establishing a “berit” (translated, “covenant” or “oath”): the blood was sprinkled on the parties to the agreement, and/or on documents or other significant elements. In other settings the term can refer to the practice of cutting the right hand of each party, and then having them grasp the bloodied hands, mixing their blood. Clearly, not many people would actually be prepared to shed the blood of an animal, nor sprinkle it on themselves or their written documents, let alone cut themselves, and expose their open wound to someone else’s open wound, on most of the occasions where they invoke a, “bloody oath”. Jesus is saying that we ought simply to be truthful, not relying on an oath to amplify the veracity of what we mean. After all, if on one occasion you say, “I will do it”, and on another you say, “I swear to God I will do it”, is the first statement any less truthful than the second? If so, it makes you a liar. If not, the oath is superfluous. Simply let your “Yes” mean “Yes”, and your “No”, “No”. It is fair to include the courtroom in this list of appropriate settings for oaths as well. Solemnity is appropriate when taking responsibility for pronouncing a person, in the sight of the whole community, to be guilty or not guilty of a crime against Her Majesty. That authority is, after all, from God (Romans 13:1-7). 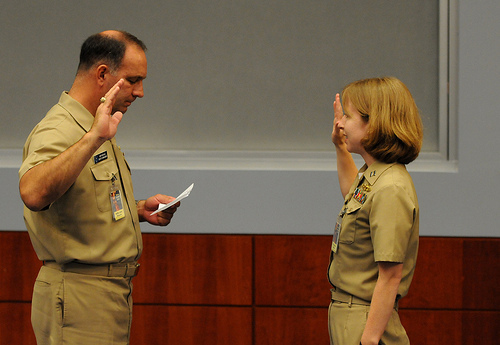 Similarly with military service and citizenship, solemnity validates the occasion of swearing an oath. So if I am ever asked to, I shall have no problem answering an official with the words, “So help me God”, in response to a standard oath. Indeed, those are the words under which I live and breathe every day of my life, so help me God.